Six months is that wonderful stage when I begin introducing my babies to solids or foods other than breastmilk. Six months is also the age when laundry gets more difficult, because of said foods landing on baby’s clothes. I’ve tried bibs, but often I feel like it’s rather pointless and I just skip the bib. Then I discovered the BIBaDO. Here’s what makes this the best baby bib I’ve ever tried. 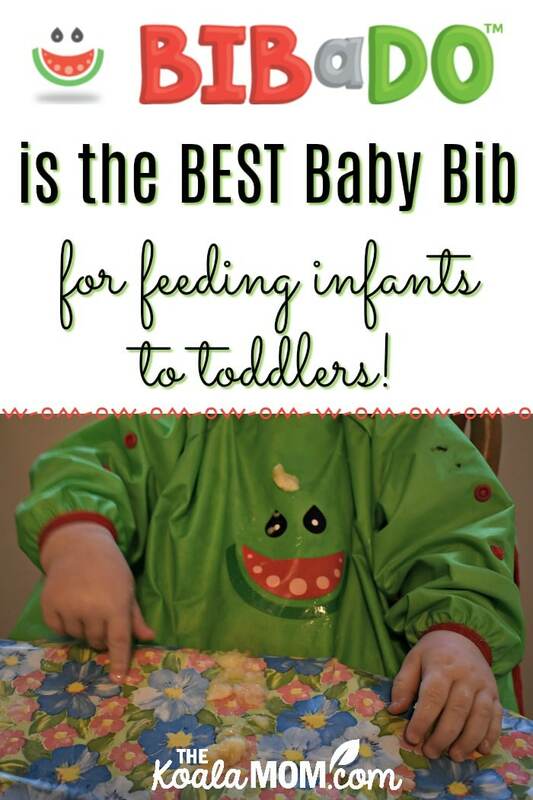 I received two BIBaDO bibs for the purposes of this review; all opinions expressed are my own. With Sunshine, I was a typical careful, first-time mom who spooned everything neatly into my daughter’s mouth. (Okay, we have a few pictures of her with food smeared all over her face, but most of it got into her tummy instead of onto her tummy.) With the next four kids, I’ve followed the practice of baby-led weaning. Baby likes it, and it’s just easier for me. I mean, it’s hard enough to feed myself while also pouring water, serving food, and chopping meat for the other kids, much less also feed the baby. If you think (like I did) that all baby bibs are like, then you haven’t met the BIBaDO. This amazing bib is keeping Joey’s clothes in the perfect condition that they arrived in. (Did I mention it’s the best baby bib ever?) Now it doesn’t matter if he attempts to lean across the table (into his banana) to grab the rest of the banana sitting out of arm’s reach (I thought), or if he decides to mash his potatoes himself with his elbow, or if all his peaches just slide straight down his chin and button-up shirt to land on his jeans. The BIBaDO covers Joey entirely while he’s in his high chair, from his neck to his wrists. This bib even covers his high chair, which makes it a lot easier to clean up. (I wish I’d had this with my first—it would have saved me a lot of time scrubbing food off our wood high chair!). The BIBaDO has an elastic strap with snaps so you can secure the bottom edge around the high chair, though I usually just tuck it between our high chair and the table. We have an Ikea wood high chair without a tray, but even if you have a tray, the BIBaDO is roomy enough to go over the tray too. It Velcros neatly behind his back, so it’s easy to put on or take off. The Velcro also makes it adjustable back there. And I’m not worried about something too tight around his neck. The first few times I used Joey’s BIBaDO, he protested slightly. He doesn’t like getting dressed (cue the wrestling match), so having to put sleeves on before eating wasn’t his idea of fun. Now he knows the BIBaDO means he’s getting food, so he’s more co-operative. I usually put a piece of food in front of him to eat while I’m getting him into the best baby bib ever. The instructions say that you should only hand wash the BIBaDO. I did throw it into my washing machine once, on the cold handwash cycle with a couple other delicate items. The bib was pretty dirty, but he’d also mashed some food into the elastics around the wrists. Then I hung it up to dry afterward. That did get it a bit cleaner than just rinsing it or wiping it. The Bibado has adjustable sleeves so one-size-fits-all. You can use it from baby’s first foods at 6 months until she can get food into her mouth without dropping it into her lap fifty percent of the time. You can see that Pearl (who just turned 3) still fits the BIBaDO comfortably. I haven’t buttoned up the sleeves for Joey, but they aren’t too short for Pearl either. I love the fact that the BIBaDO grows with your child and can be used beyond the baby-led weaning stage. This multi-purpose factor is another reason why it’s the best baby bib ever. 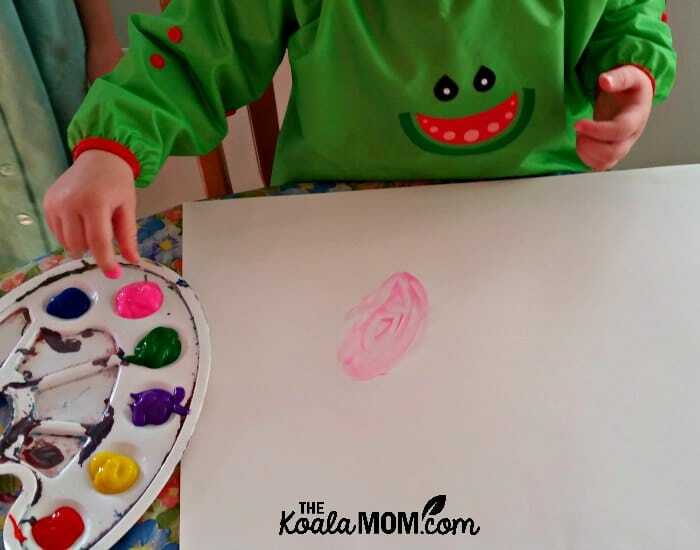 We’ve tried a few other paint smocks for the girls, but many smocks (like many bibs) don’t completely cover the kids. The BIBaDO does! The Bibado is free from BPA and phthalates. It’s waterproof and stain resistant and can attach to any high chair. It’s also easy to take on the go (if you’re brave enough to dine out with a baby! ), with a built-in pocket. It’s currently available in green but more colours are coming! For more about the Bibado, drop by their website. You can also find Bibado on Facebook and Instagram. Right now, you can get FREE shipping on your Bibado order! Just use code koala at checkout. 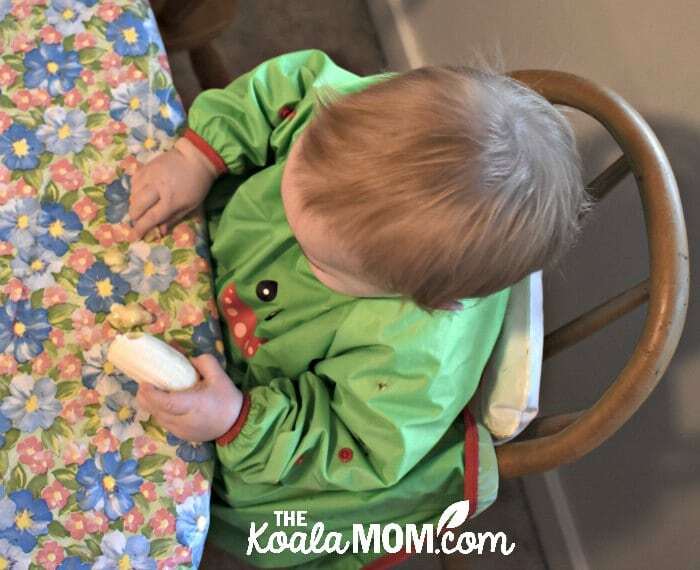 To find out how the BIBaDO helps Maman Loup keep not one but TWO babies clean during meal times, check out her review. I also love her recommendation for using the BIBaDO with the Guzzie & Gus perch. I have the same perch and use it frequently for church potlucks, camping, and visiting Grandma. 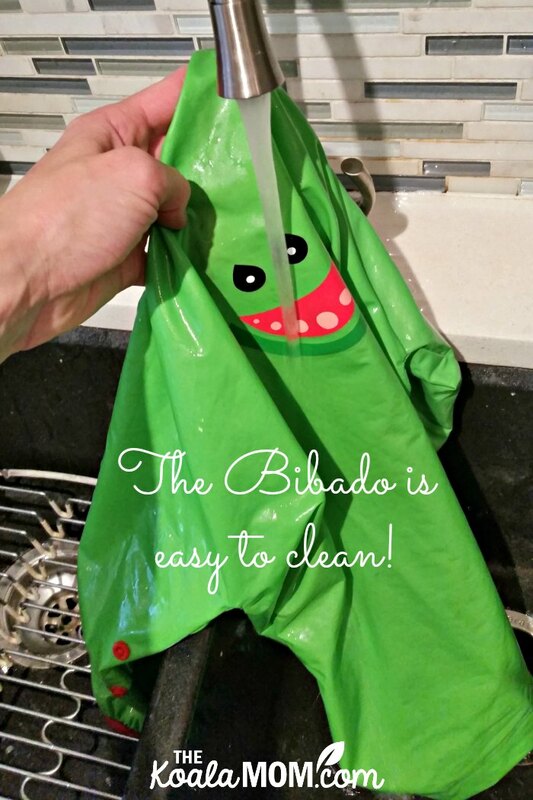 While the cover is washable, the BIBaDo would definitely help protect it and make less laundry for me.